Risshakuji Temple (立石寺), also known as Yamadera, the mountain temple, is one of the popular travel spots in Yamagata. It was built in 860 by Jigaku Daishi. It is famous for the temple of breaking bad luck, and many people visit here to pray for their good luck. 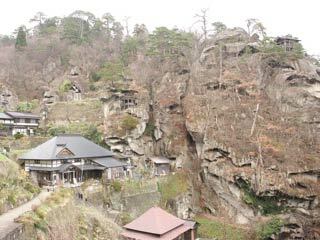 It is very unique temples because most of temples are located on the edge of hard cliffs, and have great views of a valley. The Hiku Master, Matsuo Basho had visited here and wrote his poem. Yamadera's official name is Hojuzan Risshakuji Temple (宝珠山立石寺). It was built in 860 by Tendai Buddhist priest, Jigaku Daishi. In 1356, Shiba Kaneyori, the first castle lord of Yamagata, supported Risshakuji and built many temples. Some of those temples still remains and chosen as historical assets of Yamagata. They are also one of the oldest building in Japan as well. "How still it is! Stinging into the stones, the locusts' trill." ... has main temple called Konpon chudo Temple, the bell tower, and the Sanmon Gate which is built in Kamakura Period. There are over 1000 steps to the Daibutsu den. Niomon, rebuilt in 1848, have Nio Statues to watch all people's mind. THere are 4 temples which used for also the house for all monks. The cliffside were used for the training. Therefore many temples are located on the cliffs. Monks had to climb up to practice, and those who had unnecessary desire always fell. ... are located on the highest level of the temple. Okunoin has Shaka Statues which Jigaku Daishi took with him during his practice at China. In Daibutsuden, there is 5m high Great Buddha statue. ... are the first temple established by Jigaku Daishi. It has great view of the valley.